Moog's Grandmother is a semi-modular analog synth that features a built-in sequencer, arpeggiator, and spring reverb tank, in addition to a totally reconfigurable front panel. Its circuits, spring reverb, and overall spirit are all inspired by the classic Moog modular synths. Sound Pure is proud to carry the iconic Moog Music product line! Everything from the analog synths that brought them notoriety decades ago to the Moogerfooger effects pedals and the game-changing Moog guitar. It doesn't end there though, Sound Pure also offers all official Moog accessories and even custom orders! What would the world of modern music be like without the inventions of Bob Moog? One answer would be: very boring. Bob Moog's namesake analog synthesizers have affected popular music in ways he might not have expected back in 1954 when he began building theremins with his father. But 50 years later, Bob's musical instruments have catapulted so many styles of music into the future, and his contributions to both players and technicians grow even more profound in retrospect. Where would R&B, rap and hip-hop be if groups like Parliament and Funkadelic hadn't used Moog keyboards? Where would rock and roll be if groups from Yes to the Beatles hadn't used Moog keyboards? Would jazz music have branched off into fusion without Herbie Hancock and Chick Corea using Moog keyboards? And would classical music have enjoyed such resurgence without Wendy Carlos and her modular Moog synthesizer? The questions are hypothetical, of course, because synthesizers have infiltrated every style of music, and so many companies have tried to recreate that analog sound. But above all the copycats and spin-offs, it always comes back to one name: Moog. After ten years of making theremins, providing unearthly sounds to science fiction movies and avante garde musicians, Bob Moog met experimental composer Herbert Deutsch, whose search for electronic sounds inspired Bob to create the first Moog Modular Synthesizer. Though Bob took on the project just for fun, when he premiered it at the Audio Engineering Society Convention in October of 1964 the response was immediate and Bob started taking orders on the spot. By the time he received a graduate degree (PhD in Engineering Physics, Cornell University) in the summer of 1965, the R. A. Moog Co. had delivered several modular synthesizer systems, mostly to academic and experimental composers. But it would be a few years later when public awareness of Moog synthesizers would leap ahead beneath the nimble fingers of Wendy Carlos. Carlos renowned album Switched-On Bach was released on Columbia Records at the end of 1968, achieving immediate success. The album went on to sell over a million copies, creating a sharp demand for Moog modular synthesizers throughout 1969 and early 1970. Many switched-on records were produced during that period. By the end of 1970, the now incorporated R. A. Moog Inc. introduced the Minimoog, a compact performance synthesizer based on the technology of Moog modular products, enabling keyboardists to take the Moog on the road. And that began a decade of music that would be forever altered by the Minimoog and its incomparable sounds. R. A. Moog Inc. officially changed its name to Moog Music Inc. in 1971 and became a division of the now defunct Norlin Music in 1973. Moog synthesizers were widely used by professional musicians and the "Sound of the Moog" became an integral part of our musical culture. The list of songs is far too long to print here, but from rock to R&B, from jazz to classical music, the Moog sounds were everywhere. At the end of 1977, Bob left Moog Music and in 1978 founded Big Briar for the purpose of developing and building electronic musical instruments with novel player interfaces. Actual Moog keyboards were made for the better part of the next decade by Norlin Music, but with the heart and soul of Moog gone, Moog keyboards ceased production by 1986. Though gone from his namesake company, Bob's interest in synthesizers and instruments could not be quelled. From 1978 to 1992, Bob operated Big Briar on a small scale and kept building custom instruments. He was also representing Synton, a Dutch manufacturer of modular equipment, and providing consultation services to other music technology manufacturers. In addition, Bob served as Kurzweil Music Systems Vice President of New Product Research from 1984 through 1989, and taught music technology courses at the University of North Carolina at Asheville from 1989 to 1992. However, Moog keyboards and the music they graced began a cult following amongst players and aficionados, and Bob's inventions never quite left the spotlight. Interestingly, it was his first foray into musical electronics, the theremin, that was to enjoy an early 90?s renaissance. In response to the rise in interest, Bob designed the Series 91 theremins in 1991, and Big Briar produced them for the next five years. In 1996, Bob wrote a do-it-yourself theremin article, which was published in Electronic Musician magazine. The design formed the technical basis for the Etherwave theremin, which Big Briar/Moog Music has built and sold continuously since then. In addition to the Etherwave, Bob designed the Ethervox MIDI theremin in 1998. About this time, Bob designed the product line of Moogerfooger analog effects modules, which are based on the technical principles of the original Moog modular instruments and were designed to bring the benefits of analog synthesis to all performing musicians. The result was instantaneous, as musicians worldwide scrambled to own one or all of these amazing devices. In 2002 Bob resurrected his namesake analog synthesizer, designing the new Minimoog Voyager for a new generation of Moog players. Like the Moogerfoogers, this instrument is based on the technical principles of the original Moog modular instruments and the original Minimoog, but in addition incorporates a wide range of contemporary features such as fully-implemented MIDI and a three-axis touch surface. Reviews have been nothing but positive, and Moog's Etherwave theremin, Moogerfoogers, and Minimoog Voyager have all won numerous musical instrument industry awards. Bob reclaimed the right to use the MOOG MUSIC and MINIMOOG trademarks in 2002, and immediately changed the name of Big Briar to Moog Music Inc. In 2003 Moog Music released the MOOG PIANOBAR?. Invented by Donald Buchla, a long-time colleague of Bob's and a renowned electronic musical instrument designer in his own right, the PianoBar fits onto any acoustic piano and enables the player to use the piano's keyboard to control electronically generated sounds. Moog Music's new products of 2004 (our fiftieth anniversary year) were the award winning Moogerfooger - the (MuRF) Multiple Resonance Filter Array and the Etherwave Pro, a professional theremin. The MuRF is a totally new effects processor that enriches the spectrum and animates the sound of all musical material. The Etherwave Pro is fully professional theremin that incorporates much of what Bob learned about theremin design over the past fifty years. In short, the past 50 years have been an adventurous time in music, and Bob Moog's contributions become ever-important and evident in retrospect. His dedication to the craft of making instruments is as legendary as the instruments themselves, and Bob has helped make possible the creation of some of the most important music of the 20th century and beyond. Bob has employed two guiding principles that have helped shape Moog's reputation for fine music technology products, and have enabled Moog's musician customers to create so much of the great music of our contemporary culture. In his own words, Bob states: First, we have sought out musicians who make creative use of electronic instruments, and have asked them for their advice and opinions on what sorts of products we should offer, and what features these products should have. Keeping in constant touch with musicians from all fields of music, and from all over the world, has enabled us to design instruments that have proven to have enduring musical worth. Second, our design work is an ongoing collaboration with many technically-trained people. For instance, many Moog products, including our recently-introduced Minimoog Voyager, have benefited from our collaboration with Rudi Linhard, a German colleague of mine. And of course, the Piano Bar, our latest product, is an ongoing collaboration between Don Buchla and us. Don has been a fellow designer for forty of the past fifty years. In keeping with the tradition of excellence, the first new editions of 2005 from Moog Music Inc. will inspire and amaze. The Minimoog Voyager is now available in a new 19in Rack Mount Edition. With many features, including the backlit front panel and presets from the Voyager, this Rack Mount is designed for anyone who is looking for an exceptional value in a state-of-the-art analog synthesizer. - Bob Moog Moog Music Inc. has also announced a new edition to the Voyager family, the Minimoog Electric Blue. The Electric Blue incorporates virtually all of the functions of the original Minimoog Synthesizer with sound and beauty all its own. It is housed in an ash cabinet with a fractal blue finish and the electric blue backlit front panel. Here at the beginning of the 21st century Moog Music is still producing the quality tools to create music that could not otherwise exist without them, making instruments so unique that they represent a genre of their own: Moog Music. Perhaps back in 1954, Bob Moog and his father were only trying to make something cool, to create a sound that as of yet was only in the realm of imagination, never dreaming how far their invention would take the Moog name. Whatever the original purpose, there is no doubt that Bob Moog has made his mark, and that modern music has been forever changed for the better. Thank you Bob Moog. 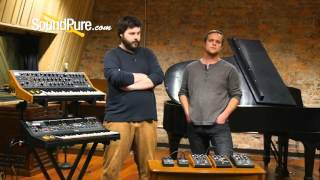 David and Nick share some of their favorite Moog pieces. Sound Pure is proud to carry the iconic Moog Music product line! Everything from the analog synths that brought them notoriety decades ago to the Moogerfooger effects pedals and the game-changing Moog guitar. It doesn't end there though, Sound Pure also offers all official Moog accessories and even custom orders! What would the world of modern music be like without the inventions of Bob Moog? One answer would be: very boring. Bob Moog's namesake analog synthesizers have affected popular music in ways he might not have expected back in 1954 when he began building theremins with his father. But 50 years later, Bob's musical instruments have catapulted so many styles of music into the future, and his contributions to both players and technicians grow even more profound in retrospect.